Dyna-Ski Boats custom builds outboard powered water ski boats for recreational skiers and show ski clubs. We have customers all over the world including Malaysia, the Caribbean, Moscow, Russia, the Cayman Islands and Canada. This blog is used to keep readers informed about what is going on at Dyna-Ski and answers questions that are frequently asked. 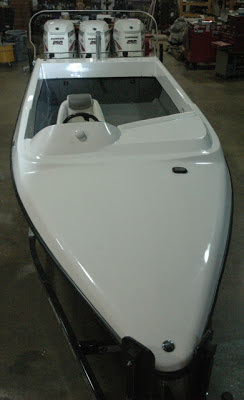 You can also visit www.dyna-ski.com for more information about our boats. Contact Dyna-Ski at info@dyna-ski.com or call 715-854-7501. It has been suggested to me to put more information on this blog about the Dyna-Ski boats we build for show ski teams even though many folks interested in Dyna-Ski Boats are not likely to purchase one of these specialty water ski boats. We do learn things from the folks buying and using these powerful tow boats. Similar construction techniques and materials are used in all the Dyna-Ski Boats we build. The 20' Models are all built from the same hull mold. 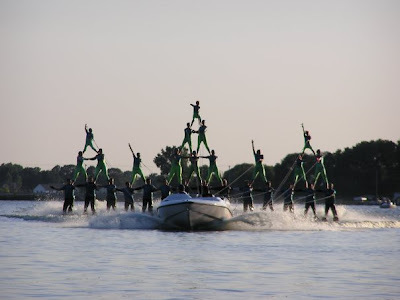 The show ski tow boats are intended to safely pull lots of water skiers all at the same time. Show ski clubs have many acts in their shows so the boats are called on to pull everything from one skier to pyramids with many skiers. There are show ski clubs all over the world although the vast majority of them are in the US and Midwest area. If you have never seen a ski show you owe it to yourself to take one in if you can. The most well known is the Tommy Bartlett professional ski show in Wisconsin Dells on Lake Delton. The water ski show clubs are much bigger shows often times with many more skiers than the Bartlett show though. 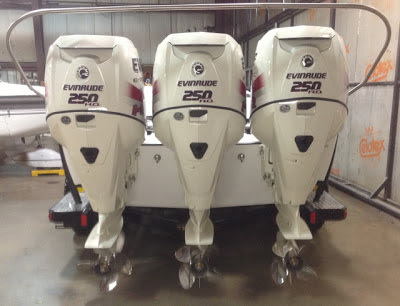 The Waterboard Warriors triple motored Dyna-Ski 20' Closed Bow we just finished up is a very slick powerful tow boat. It has three 250 HO Evinrude E-Tec Engines. The Dyna-Ski boat has Evinrude I-Con engine monitoring and control system which uses a single data cable instead of six mechanical cables and associated wiring to control all three engines. The I-Con System is pricey but provides awesome control of the motors. We almost always put a GPS Speedometer on Dyna-Ski boats and this system has it also. 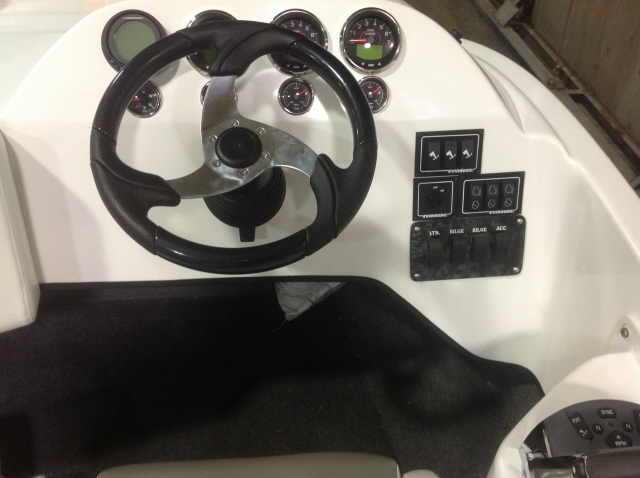 There are only 2 controls for the three motors making the boat very easy to drive. 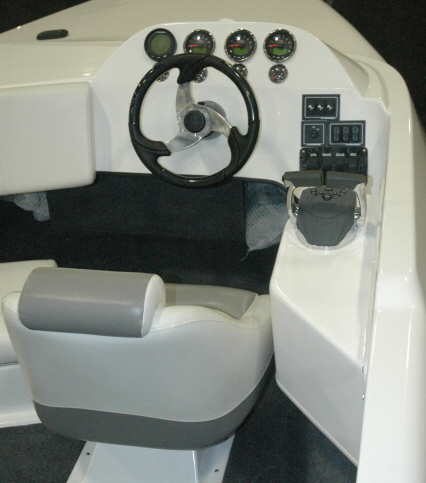 Teleflex Hydaulic steering is used on most models of Dyna-Ski Boats. This tow boat has an optional power assist unit to make the three motors as easy to steer as your vehicle even with over 800 horsepower and massive torque. The electric pump is located out of sight in the back of the motor well with a switch on the dash to turn it off and on. The pylon mounting brackets have two positions to fine tune the height of the pylon. There are two steering cylinders and two tie bars used in this steering system. 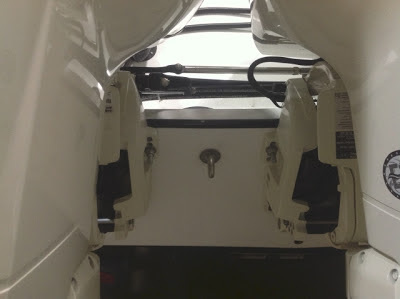 A twin motored Dyna-Ski boat normally has one cylinder and one tie bar. Recreational single motored Dyna-Ski Boats usually have one cylinder. This system uses a pair off Tees and short hoses connecting to the cylinders on the outside engines. The tie bars have to be shortened for this application as the motors are very close together. 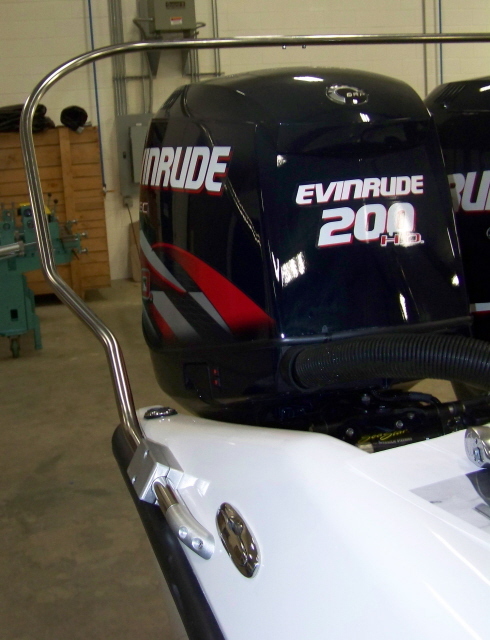 The Evinrude motor on the left side has a counter rotation lower unit to help even out the push of the motors and reduce steering effort. 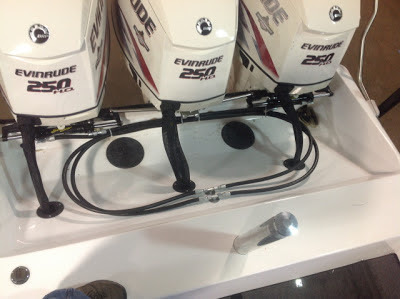 Even with the power assist steering this helps balance the pull and ride of the Dyna-Ski Boat. Notice that the props blades look different as the counter rotation motor needs this to make it work properly. 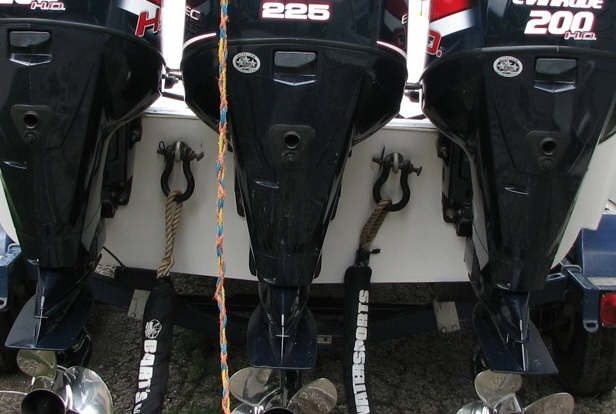 The two towing eyes located between the motors are used for pulling bigger acts as the lower pulling points help keep the nose of the boat down and the boat pulls more skiers. Ski clubs have various methods of hooking ropes to these two towing eyes. 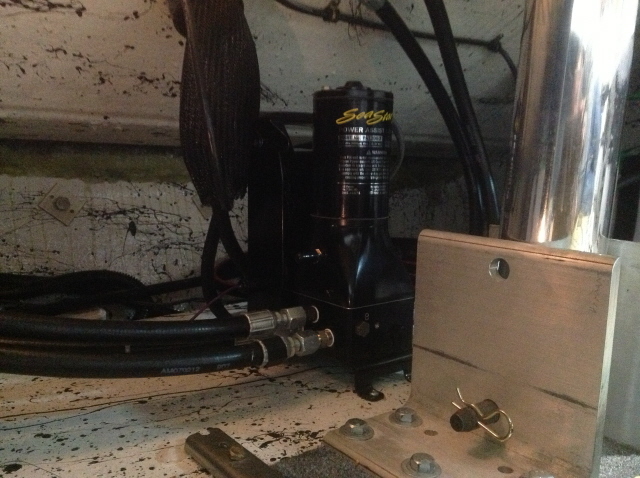 During construction the Ski Team decided they wanted tilt steering so the non-tilt 2.4 helm was changed to a tilt unit. Luckily this was decided before fluid was installed in the system. There are switches to the right of the steering wheel for turning the system on, starting the individual motors, enabling the engines, tilting individual motors, turning on/off the steering unit, two bilge pumps, lights, etc. 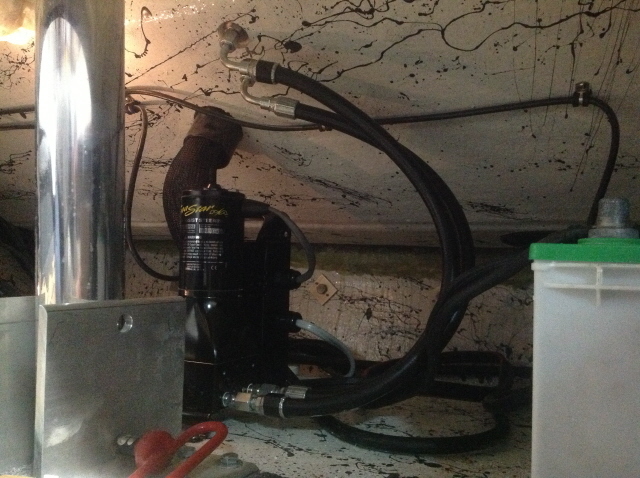 The area under the motor well is pretty full with three batteries and three oil tanks. The gas tank is located in the front of the Dyna-Ski Boat under the deck of the bow. There are 420 lbs of sand bags in front of and next to the 43 gallon gas tank. The sand bags help to balance the boat on the water and help provide tongue weight for trailering. Three pickups and three fuel lines are used for fuel. The show ski boats have recessed cleats just like all the recreational Dyna-Ski models do. The rope guards are mounted on the outside of the boats to help prevent any of the many ropes from catching. The Dyna-Ski show ski tow boats have removable bow and stern lights. 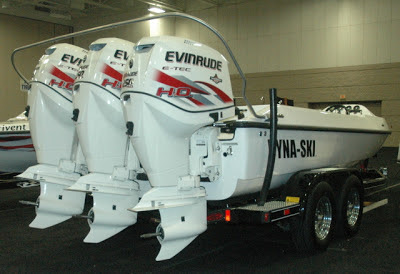 2012 Dyna-Ski Boats LLC. Powered by Blogger.